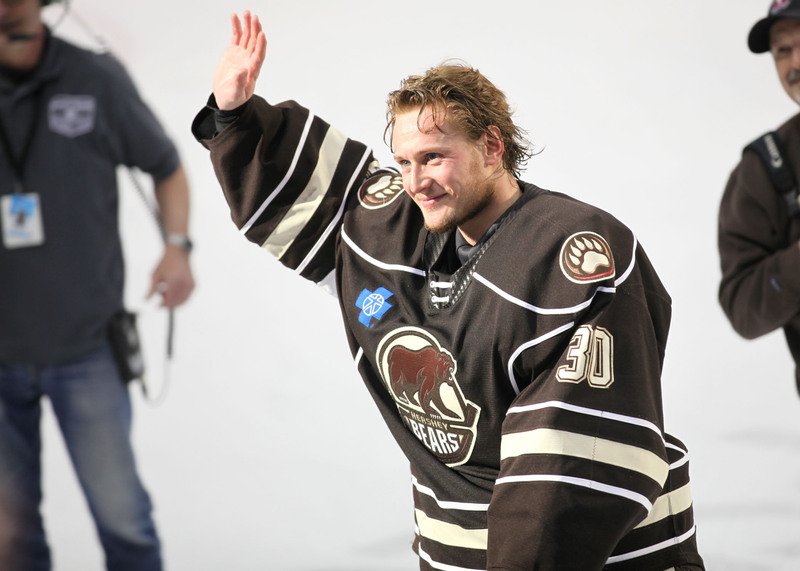 The Hershey Bears beat the Belleville Senators 3-2 (SO) Sunday afternoon at Giant Center. The win improves the Bears record to 23-20-0-3 on the season. The win gives the Bears points in nine-straight games. The Bears are back in action Wednesday night when they visit the Thunderbirds in Springfield. Puck drop is set for 7:05 PM. The Bears would strike first with a goal from Shane Gersich 7:11 into the first frame. The Senators would answer before Mike Sgarbossa tallied his 21st goal of the season for a 2-1 Bears lead at the first intermission. The Senators would tie it in the third period, sending the game to overtime. The Bears would win it in the shootout with a goal from Riley Barber and three stops from Vitek Vanecek. Scratches: Colby Williams (lower body), Lucas Johansen (upper body), Kris Bindulis (upper body) and Joey Leach were the injury scratches. Max Kammerer and Mason Mitchell were the healthy scratches. Lucas Johansen returned to practice on Friday January 25 and is currently listed as “day-to-day”. He has been out of the lineup since November 23rd. Christian Djoos was officially assigned to Hershey today for conditioning. He will play Sunday and Wednesday, then return to Washington. The Bears would be the benefactors of the game’s first power play at 4:35 of the opening frame, but could not capitalize. However, the Bears would once again strike first with a goal from Shane Gersich at 7:11 of the opening frame. Liam O’Brien (8) was credited with the lone assist. The Senators would respond to tie the game with a power play goal from Jack Rodewald at 9:48 of the first stanza. However, Mike Sgarbossa would restore the Bears lead less than a minute later with his 21st goal of the season at 10:43 of the first period, making it 2-1. Steve Whitney (5) was credited with the lone helper. The period would conclude with the Bears lead 2-1. Bears led in shots on goal 9-6 after 20 minutes. The Senators were 1 for 1 and the Bears 0 for 1 on the power play. The Bears and Senators would skate to a scoreless middle frame. Hershey led in SOG 11-8 in the middle frame, and 20-14 after 40 minutes of play. The Senators were 1 for 3 and the Bears were 0 for 4 on the power play after 40 minutes. The Senators would tie the game 1:00 into the final frame with a goal from Drake Batherson, making it 2-2. Nathan Walker was called for a five-minute match penalty for a low knee-to-knee hit on a Senator with 3:33 left in the game. He is suspended until he has a hearing with the league. The Bears would kill the portion of the Senators five-minute power play during the remainder of regulation, sending the game to overtime. The Bears would win it in the shootout. Riley Barber would score, and Vitek Vanecek was perfect in goal. The Bears have earned points in nine-straight games. Vitek Vanecek stopped 27 of 29 for a .931 save percentage. The Bears were 0 for 7 and the Senators 1 for 4 on the power play. Shane Gersich led the Bears in shots with 6. This entry was posted in News and tagged Belleville Senators, Hershey Bears, Jon Sorensen, Mike Sgarbossa, Riley Barber, Shane Gersich. Bookmark the permalink.